We are a scant ten days away from the end of the first-half, and the Yankees trail the Red Sox by one game for the best record in baseball. The Yankees will play three against the Blue Jays, four against the Orioles, and four against Cleveland (all on the road) before the All-Star break, and the Red Sox will square-off against the Royals, Rangers, and Blue Jays. 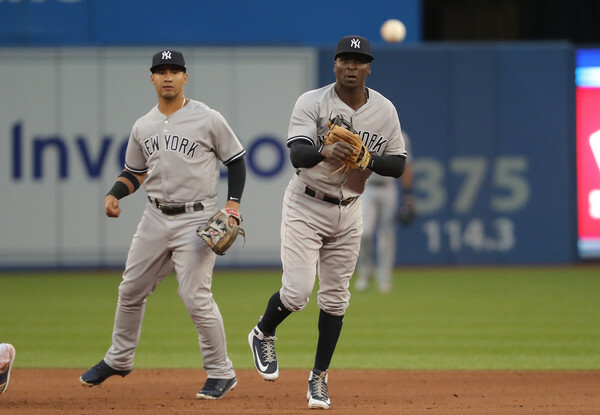 The Yankees pitching staff was excellent, holding the Blue Jays to just ten baserunners and two runs in 22 innings (the second game went to extras), while striking out 24. The bullpen was particularly dominant, pitching to a combined line of 7 IP, 2 H, 0 R, 0 BB, 10 K.
Sonny Gray had his best start in pinstripes in that second game, going 8 scoreless innings and allowing just four baserunners, while striking out 8. Aaron Judge sat out the first game on the heels of his dreadful performance in the double-header against the Orioles – lest we forget that he went 0-f0r-9 with 8 strikeouts. That bit of rest must’ve helped, as he hit what proved to be the game-winning two-run homer in the top of the 13th. You might remember that particular moonshot for this young fan’s reaction. Josh Donaldson, Jaime Garcia, Aaron Sanchez, Ryan Tepera, and Troy Tulowitzki are all on the disabled list, and none are slated to return in time for this series. Toronto is 40-46 with a -41 run differential, and are currently sitting in fourth in the AL East. They’ve played fairly well since their last meeting with the Yankees, going 14-11 with a -5 run differential. They’ve been discussed quite a bit as a potential seller as we approach the trade deadline, but injuries to free agents to-be Josh Donaldson and Marco Estrada (he left Tuesday’s game early with an glute strain) may put a damper on just how much they can get back. Last time around, we wondered if we’d get to see Vladimir Guerrero Jr. anytime soon, and the answer proved to be no. And that doesn’t seem likely to change for at least a few more weeks, as he’s been out since June 6 with a strained patellar tendon. It seems as though the team’s injury woes aren’t just limited to the big club. Kendrys Morales (87 OPS+) may see starts at first and/or DH, and we’ll probably see Aledmys Diaz (83 OPS+) at short, too. Gaviglio shut the Yankees out for 7 innings back on June 6, striking out 4 and keeping 70% of batted balls on the ground. He has been significantly less effective since then, pitching to a 6.16 ERA in four starts (19.0 IP). The Yankees knocked Happ out in the fifth inning back on March 29, scoring three runs and forcing the southpaw to throw 96 pitches (nearly 40% of which were balls) in 4.2 IP. 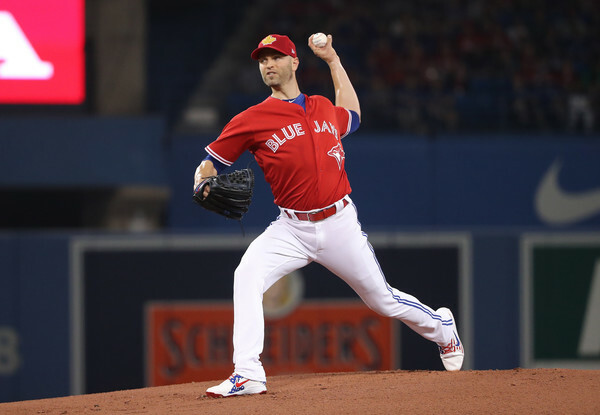 Happ is striking out a career-best 26.3% of batters, walking just 6.7%, and maintaining a league-average 44.4% groundball rate; a bit of gopheritis, however (1.23 HR/9) has elevated his ERA to 4.03 (104 ERA+), his worst mark since 2015. Borucki, a fifteenth-round draft pick back in 2012, made his big-league debut two weeks ago, and has performed admirably through two starts (2.77 ERA/2.33 FIP in 13.0 IP). 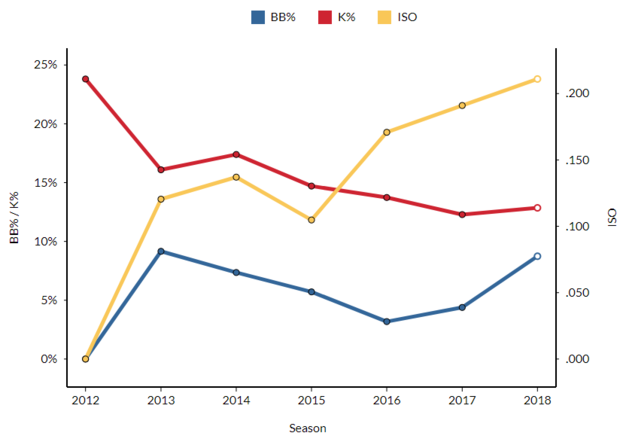 It has been a long road for the 24-year-old rookie, as he missed all of 2013 and most of 2015 with injuries, but he has performed well up each rung of the ladder in the minors. Gibbons compared Borucki to Mark Buehrle, which is equal parts lazy, accurate, and unsurprising – he’s a lefty that throws a low-90s four-seamer, a low-80s change-up, and a high-70s slider. Closer Roberto Osuna was given a 75-game suspension (retroactive to May 8) for violating MLB’s domestic violence policy, and is not eligible to return until August 5. 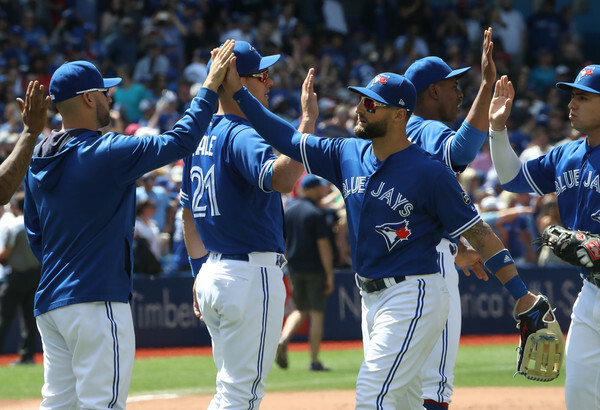 Other than that news finally being handed down, not much has change in the Blue Jays bullpen since these teams last met – Seung-Hwan Oh and Tyler Clippard are a pseudo-closer-by-committee, with Aaron Loup and John Axford handling the middle innings. J.A. Happ is auditioning for his next team, and the Yankees are almost certainly interested – so his start is worth watching a bit more closely. That first part applies to Justin Smoak, as well, but I don’t see him as a target for Cashman and Co. given his middling production thus far. Betts and Martinez. (Omar Rawlings/Getty). Tonight represents not only the battle for first place in the AL East, but also the beginning of the Yankees last homestand of the first half. 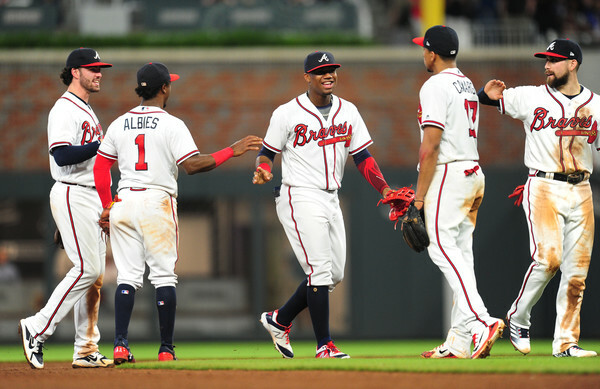 They’ll host the Red Sox for three games, and then welcome the Braves for another three, before hitting the road for 11 games in 10 days. Aaron Judge had a great series, going 5-for-10 with a home run, five RBI, and four walks (against just two strikeouts). Judge’s home run was this rocket off of Craig Kimbrel, which was the hardest-hit ball (at 117 MPH) the Red Sox closer has ever allowed. Luis Severino was quite good in the first game, producing the following line: 6 IP, 6 H, 2 R, 2 ER, 0 BB, 11 K. I mention this because it was, by game score, his 10th best start of the season … which is insane. He’s a capital-a Ace. Dellin Betances surrendered what would be the game-winning home run in the third game, which is bad. Since then, however, he has pitched to the following line: 19.0 IP, 2 H, 1 R, 11 BB, 32 K, 0.47 ERA. And that’s good. Check out Katie’s Yankeemetrics post for more information on the series as a whole. The Red Sox remain fairly banged-up, with Dustin Pedroia (knee inflammation), Drew Pomeranz (biceps tendinitis), Carson Smith (season-ending shoulder surgery), and Steven Wright (knee inflammation) all on the disabled list, and out until mid-July at the earliest. And then there’s Tyler Thornburg, who has been awful in his rehab tour of the upper minors; he’s eligible to return now, and his 30-day rehab window closes soon – whether or not he’ll get the call is anyone’s guess as of now. 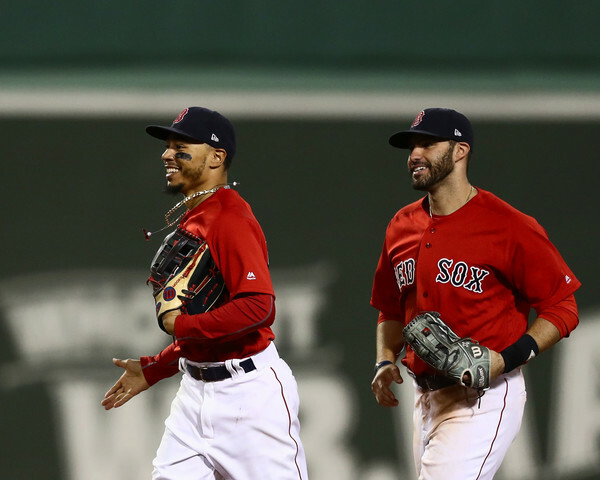 Boston is an MLB-best 55-27 with a +125 run differential, and are currently a game ahead of the Yankees in the AL East (and for the best record distinction). They’ve won four in a row by a combined score of 27-9, and are generally playing excellent all-around baseball. And, just for the sake of comparison, they’re one of two teams with a 17-1 stretch this season, with the Yankees being the other. Painting in broad strokes, the Red Sox are second in the majors in runs scored, second in run differential, sixth in runs allowed, and eleventh in the FanGraphs all-encompassing defense metric. If they do have a weakness, it’s the somewhat ‘stars and scrubs’ nature of their lineup, which you’ll see below. Sandy Leon (76 wRC+) will probably get a start at catcher, too. This will be the second time the Yankees see Rodriguez this year; the first time was back on May 10, when the 25-year-old southpaw tossed 5 scoreless innings, allowing one hit and three walks, while striking out eight. And that has been the norm with this match-up, to an extent, as Rodriguez sits on a 2.70 ERA in 10 starts (56.2 IP) against the good guys. The Yankees have hit him around a few times, to be sure – but he has been quite effective overall. He’s currently sitting on a 3.86 ERA (114 ERA+) in 81.2 IP this season, with above-average strikeout (26.1%) and walk (7.4%) rates. 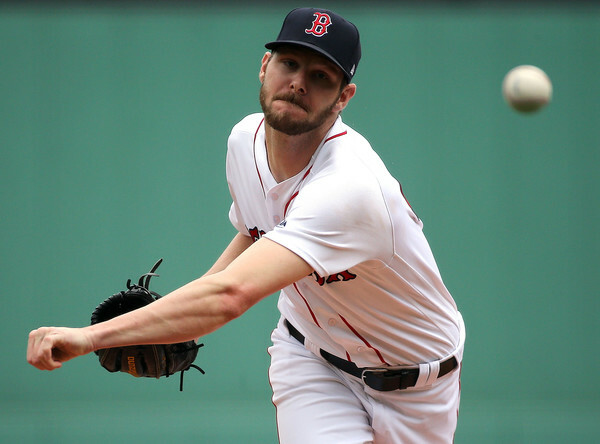 Sale’s last outing against the Yankees was very good (6.0 IP, 8 H, 1 R, 0 BB, 8 K), but it may be best remembered for being a part of a Red Sox 14-1 victory back on April 10. That was an awful game to watch, wasn’t it? But I digress. Sale has been his typically brilliant self this year, with a 2.56 ERA (172 ERA+) in 109.0 IP, with an AL-best 153 strikeouts. He’s also in the midst of a fairly dominant stretch, having allowed just four runs in his last four starts (28.0 IP). The Yankees beat-up on Price back on April 11, knocking him out of the game after just one inning. His Red Sox tenure has been up and down, to say the least, with injuries and bouts of ineffectiveness garnering headlines, and an opt-out looming at the end of this season (spoiler: he’s not going to opt-out of a guaranteed $127 MM). Price has looked like his old self for the last seven weeks or so, pitching to a 2.72 ERA (3.42 FIP) in his last nine starts (56.1 IP), along with strong strikeout and walk rates. Aaron Judge’s monstrous home run aside, Craig Kimbrel has been light’s out as the closer, posting a 2.16 ERA and 38.6% strikeout rate, and converting 24 of his 26 save opportunities. Joe Kelly is still the set-up man, and has been solid despite some ups and downs, and Matt Barnes has emerged as a tremendous late innings option. Heath Hembree and Hector Velazquez are their best middle innings options. 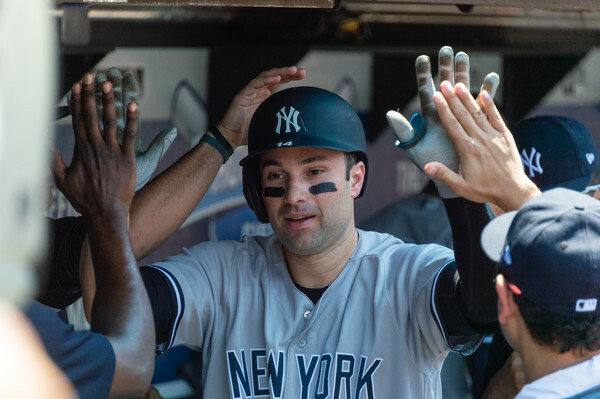 It’s a Yankees vs. Red Sox series where first place in the division (and possibly the league) is on the line – what more do you need? For the first time this season, the Yankees will play in Tropicana Field. They’re in Tampa for three games this weekend. Jonathan Loaisiga made his big league debut in the second game of the series, and was incredibly impressive in doing so. He tossed 5 scoreless innings and allowed seven total base-runners, while striking out 6. Kevin Cash, the Rays manager, compared Loaisiga to Mariano Rivera after the game – and that’s equal parts wonderful and insane. Luis Severino, not to be outdone, was even better the following day, pitching to the following line – 8.0 IP, 3 H, 0 R, 2 BB, 9 K. That represents the second-best start of his career by Game Score. Didi Gregorius had a big series, going 6-for-11 with a triple and a home run, and that may well have been the jump-start to awakening from his slumber. Chris Archer is still on the disabled list with a strained abdominal muscle, and is slated for a bullpen session today – which means he’s still a couple of weeks away, and that’s without any setbacks. Starting pitcher Jake Faria is out until August with an oblique injury, and pitching prospects Jose De Leon, Anthony Banda, and Brent Honeywell are all out for the season due to Tommy John Surgery, as well. On the position player side of things, Christian Arroyo and Daniel Robertson are both on the disabled list. Neither is expected to be out long, but their return dates remain TBD. 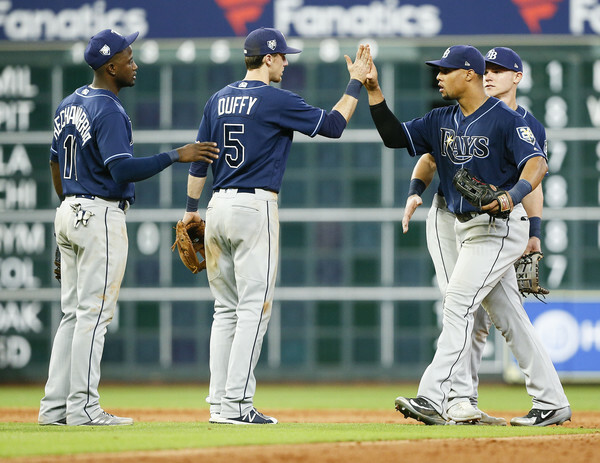 The Rays are 34-40 with a -17 run differential, and have spent much of the season jockeying for third place in the division with the Blue Jays. They’re quite a bit better at home, though, with a 15-16 record and a +15 run differential, so they’ve got that going for them. They are still using an “opener” in lieu of a traditional starter in a sizable portion of their games, with Blake Snell and Nate Eovaldi serving as the only true starting pitchers on the roster right now. The opener tends to hand the ball over to a long reliever after the first or second inning, which results in some intriguing box scores. It has been a mixed bag, but it is difficult to fault the Rays for trying something new when they have five MLB or MLB-ready starting pitchers on the disabled list. Carlos Gomez (.191/.264/332) and Adeiny Hechavarria (.285/.312/.354) will find their way into the lineup, as well. Stanek has opened six games this season, pitching to the following line: 9.0 IP, 3 H, 2 R, 3 BB, 9 K. That’s … surprisingly good. Of course, he has only completed the second inning once (and has maxed-out at 40 total pitches), so the Rays will lean heavily on the bullpen once he leaves the game. He opened against the Yankees last Saturday, and he threw a scoreless 1.1 innings. The Yankees won that game 4-1. Stanek is a flamethrower, featuring a high-90s four-seamer, a high-80s splitter, and a high-80s slider. Those two breaking balls are legitimate swing and miss offerings, too. The Rays are Font’s third organization this season, and it’s not too difficult to understand why when you see his 7.56 ERA with the Dodgers and A’s. However, he has been quite good for the Rays, pitching to a 2.20 ERA (184 ERA+) in 16.1 IP; he’s also being stretched-out to be an actual starter, with his pitch counts climbing by 15-plus pitches in each of his last three outings. He’s only pitched into the fifth inning once, but it stands to reason that he can go deeper into the game if needed. Font throws five pitches – a mid-90s four-seamer, a mid-90s sinker, a mid-80s change-up, a mid-80s slider, and a mid-70s curve. It’s a starter’s arsenal and he only recently turned 28, so the Rays might’ve found something here. The Yankees roughed Snell up last week, scoring four runs in five innings and putting nine runners on-base. 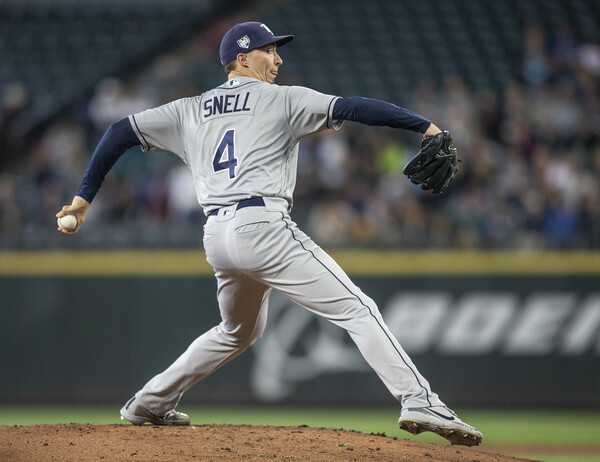 Snell – who was taken one pick after Dante Bichette Jr. back in 2011 – has otherwise been one of the best starters in baseball this year. And he has a 0.96 ERA at Tropicana Field. The Rays currently employ a closer-by-committee, with Sergio Romo (5.46 ERA), Jose Alvarado (3.00 ERA), and Chaz Roe (2.79 ERA) seeing most of the ninth inning action. They also have a trio of long relievers in Austin Pruitt, Matt Andriese, and Ryan Yarbrough – at least one of which will come in to relieve Stanek today – and one of the best stories in baseball in Jonny Venters. I’m excited to see how Domingo German follows up on his terrific outing against the Mariners, as well as the prospect of a pitchers duel between him and Snell. And the Rays in general fascinate me, with their aggressive bullpen-ing and high-risk approach on the bases. Worry not, dear reader, for the dreaded trip to Seattle (and Oakland) isn’t until September. That doesn’t necessarily make this match-up any better, though. The first game of the series was one of the most frustrating in recent memory. The Yankees left thirteen runners on-base in total, and left the bases loaded three times. Aroldis Chapman, who lost his job as closer a week earlier, surrendered a go-ahead (and game-winning) pinch-hit home run in the 11th. Ugh. Greg Bird returned to the lineup after missing nearly four months of action in the second game, and he looked pretty good. He went 1-for-2 with two walks and a run scored, and played all nine innings at first. That second game also included somebody named ‘Jacoby Ellsbury’ going 2-for-4 with a home run and four RBI. That guy went 4-for-10 in the series as a whole, with a double, that home run, a walk, and 6 RBI. Seattle made five errors in one inning in the third game, which made things pretty easy for the Yankees offense. Masahiro Tanaka twirled a gem, as well, tossing 7 innings of 1 run ball, and striking out 10. The Mariners have half of a bullpen on the DL, with Dan Altavilla, David Phelps, Erasmo Ramirez, and Nick Vincent out with a variety of ailments. Phelps had Tommy John Surgery in March, so he won’t be back any time soon, and Altavilla has a nebulously named “mass sprain” in his elbow, so his return is up in the air, as well. The other two could be back this month, but probably not in time for this series. Seattle is 46-26 with a +22 run differential, good for second-place in both the AL West and the AL Wild Card race. They’ve overachieved quite a bit relative to their Pythagorean expectations, which place them as a 38-34 team. That’s not shocking, considering that they have the 4th best winning percentage in baseball, and the 12th best run differential. The Mariners are basically a middle of the pack team, sitting 12th in runs allowed, 13th in runs scored, and 22nd in defensive runs saved. Their biggest strength as of now is the bullpen, which is among the five-best in the game by pretty much every measure. That isn’t to say that their offense or starting pitching is bad; rather, that it’s good enough to be put over the top by a light’s out bullpen. And that’s been the key to their success so far. All that being said, their biggest story so far may well be Robinson Cano’s 80-game suspension for violating the league’s joint drug agreement. He’s not eligible to return until August 14 and, when he does, he might not get his full-time job back. Denard Span (.259/.368/.415, 6 HR, 6 SB) could see some time in left, as well. Despite being a top-50 prospect a few years ago, Gonzales never received much of an opportunity with his original organization, the Cardinals. He was shipped to Seattle for prospect Tyler O’Neill last July, and the Mariners stuck him in the rotation. Things were a bit rocky last season, but Gonzales has been very good in 2018, pitching to a 3.42 ERA (117 ERA+) and 3.20 FIP in 79.0 IP. His 21.1% strikeout rate is right around league-average, and his 46.8% groundball rate and 5.8% walk rate are comfortably better than average. Gonzales is a true five-pitch guy, working with a low-90s four-seamer, low-90s sinker, high-80s cutter, mid-80s change, and high-70s curve. Much of his success this year has been attributed to that cutter, which he only starting throwing this past off-season. The once-dominant King Felix is a shell of his former self at 32, sporting a 98 ERA+ since Opening Day 2015. This has been his worst season to-date, though, as he has a 5.44 ERA (73 ERA+) and 4.67 FIP in 84.1 IP, having allowed four or more runs in 7 of his 15 starts. He does have a 4.00 ERA in June, though, with two strong outings sandwiched around a 3-inning, 6-run effort on June 9, so the flashes are still there … to some degree. Hernandez’s once elite velocity is gone nowadays, as his four-seamer averages 90.3 MPH this year, a full MPH lower than 2017. He still throws the same arsenal, albeit with a reduced velocity – that four-seamer, a high-80s sinker, a mid-80s change-up, a low-80s slider, and a high-70s curve. Paxton struck out 16 A’s on May 2 and followed that up by no-hitting the Blue Jays his next time out, in the midst of an utterly dominant stretch that saw him pitch to a 1.75 ERA in 56.2 IP. He’s been mortal around those eight games, though, and that’s largely been the story of his career. And he’s never faced the Yankees. Paxton is primarily a three-pitch guy, focusing on his mid-90s four-seamer, high-80s cutter, and big-breaking, low-80s curve. He’ll also throw a mid-90s sinker and a mid-80s change-up, but those are oftentimes little more than show-me pitches. Edwin Diaz is the closer, and his numbers are kind of absurd. He has more than three times as many strikeouts (62) as hits allowed (20), and he’s striking out 42.5% of all batters. 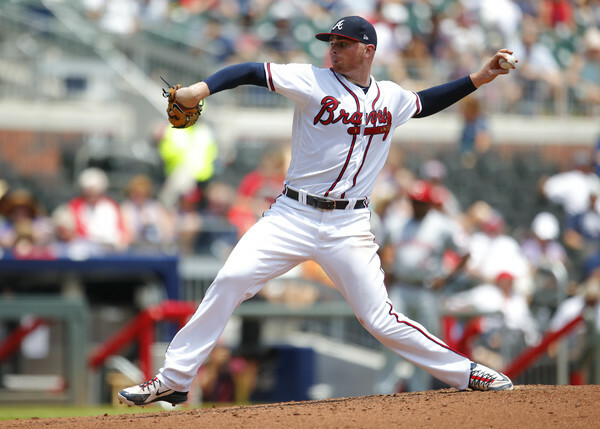 He already has 27 saves, which is five more than the second-place Craig Kimbrel, and his 2.56 WPA is ninth among all pitchers. James Pazos (1.48 ERA in 24.1 IP) and Chasen Bradford (3.21 ERA in 28.0 IP) have done the heavy lifting behind Diaz, and they’ve been very good so far. 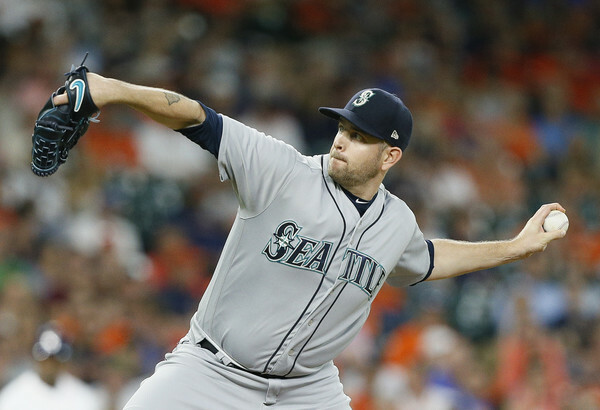 The rest of the bullpen has been something of a revolving door due to the aforementioned injuries, but the newly acquired Alex Colome (3.68 ERA in 7.1 IP for the Mariners) has high-leverage experience. 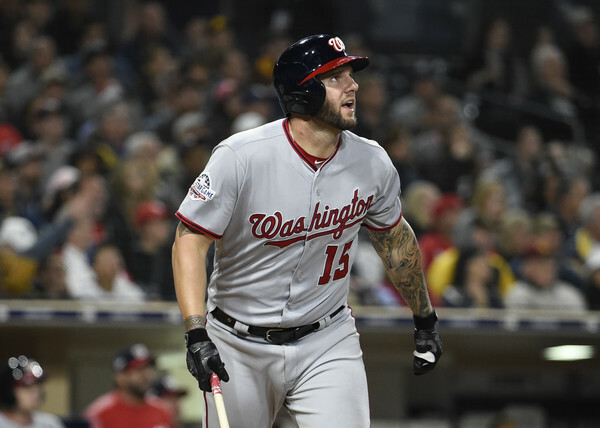 A few have been mentioned so far – Cano, Ben Gamel (parts of seven years), and James Pazos (six years) were all brought-up through the Yankees organization. You’ll also remember Nick Rumbelow, who rode the shuttle for the Yankees in 2015 and was dealt to Seattle last November; you may not remember Wade LeBlanc, who pitched one awful inning for the good guys back in 2014 and was a non-roster invite to Spring Training this year. He has a 2.63 ERA (152 ERA+) in fourteen games this year, because of course he does. Paxton’s curve is a sight to behold, and Diaz is just filthy all-around; hopefully the Yankees won’t have to see him at all this week. 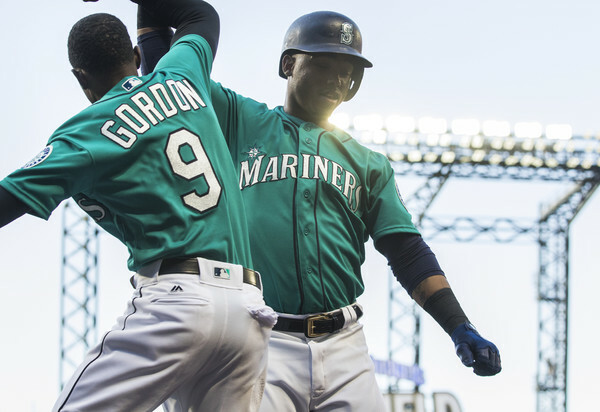 And Gordon and Segura have a vibe that’s not all that different from Starlin Castro and Didi Gregorius, if you’re into that sort of thing.